We're delighted to be bringing back Project Barista for 2018! This series (introduced last year) combines two of our greatest passions, beer and coffee, and explores the relationship between the two. 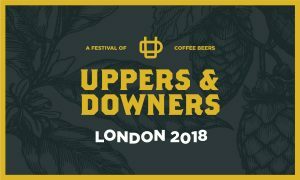 "Uppers & Downers will bring together roasters and brewers pouring experimental one-off coffee beer collaborations. Our goal with U&D is to focus on coffee as a specialty brewing and blending ingredient with origin. To that end, you'll get to experience coffee beers in a range of unexpected styles, extraction methods, and blending techniques that showcase the innovative flavours, aromatics, and textures in the finished beer." Breakfast Shake - 9.5% Imperial Wheat Stout with Coffee & Cacao Roaster: Climpson & Sons Coffee | Coffee: Brazil - The Baron The inspiration for Breakfast Shake came from brewer Sam’s favourite morning smoothie - blending coffee, honey, cocoa powder, almonds and banana. 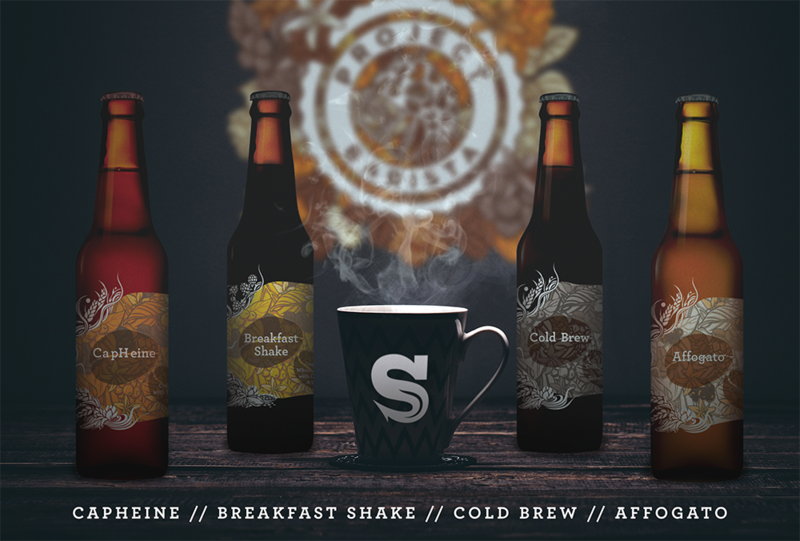 Our Breakfast Shake takes some of those flavours, re-worked from the ground up, to develop a showcase coffee beer. Rather than adding banana, we chose to use a classic German wheat beer yeast - Weihenstephaner - to offer those notes. This technically makes it a Dark Wheat beer or Dunkel Weiss, but yeast aside it’s more akin to a Siren Imperial Stout. There are 13 different speciality malts in the grist. We’ve added cacao husks for deep, ultra-dark chocolate flavours along with cacao nibs for creamy milk-chocolate. Climpson & Son’s Brasil Espresso is a beautifully rounded roast and adds a real nuttiness to proceedings. Cold Brew - 5% Cold-Steeped Coffee Schwarzbier Roaster: Climpson & Sons | Coffee: Brazil - Fazenda Esperanca The idea for Cold Brew came to our brewer, Kit, whilst out on a dog walk with a black coffee gone cold. It occurred to him that despite coffee tending to be dry, as an ingredient it is most often used in big, sweet beers. We chose a black lager to take on this trope and attempt to develop the full flavours we associate with coffee beers but in a light, dry and drinkable style of beer. We started out by selecting black and brown malts that would contribute coffee and chocolate notes but minimal burnt or bitter flavours. To further reduce any potential harsh or astringent tones from the malts, we cold steeped all the dark grains in the mash tun overnight, running that off into the kettle before mashing in the remaining grist. There’s a delicate hopping of Amarillo and Ekuanot to bring some high-end fruit flavours to the beer, but by our standards this is reasonably low in quantity to drive the rich malt character. Once the fermentation process began to calm down, it was time for the coffee to shine. We cold-steeped 25kg of Brazilian Topazio & Rubi from Climpson’s Coffee, which has contributed a host of fudge, caramel and soft fruity coffee flavours to the beer. capHeine - 6.2% Coffee Sour with Hibiscus Roaster: Quarter Horse | Coffee: Costa Rica - Cerro Dragon CapHeine is making a return following last year’s popular debut. For Project Barista 2018, we’re omitting the raspberries to really let the hibiscus and hot-brewed coffee shine. We worked with Quarter Horse on the coffee, a Costa Rican ‘Dragon’ that is absolutely full of berry notes. To get the coffee into the beer, we manually hot-brewed some 300l of coffee. On this occasion, cold-steeping would not have allowed the acidity and high-end berry notes we were looking for from the coffee to come through in the beer itself. It was a painstaking process but one we felt was necessary to let the coffee really do its thing, which is what this series is all about. The base beer is a blend of Golden Promise and Lager malts, with a small amount of other grains included for body and head retention. We kettle soured it to a pH of around 3.5 before the boil, where we added a sprinkling of fruity hops to start layering up the flavours. In the whirlpool we steeped 10kg of the coffee before cooling further and dosing again with floral, fruity and citrus-led hops along with 20kg of dried hibiscus. A moderate dry-hop charge is added post-fermentation and after it’s cooled we bring in the hot brewed coffee. This will be the least obvious coffee beer of the project because it’s all about drawing out the tart, berry notes. The result is a beautifully layered sour beer that we can’t wait for you to try. Affogato - 6% Coffee & Ice Cream Ale Roaster: Quarter Horse | Coffee: Brazil - Fazenda Sertão Yellow Bourbon Our influence here is the classic Italian Affogato, where the combination of full flavoured bitter espresso meets silky sweet vanilla. Quarter Horse Coffee worked with us to develop a Brazilian roast beyond where we would usually pitch it for drinking. We wanted to push the chocolate, coffee and roast notes to give us impact in the final beer. The base beer here is pale, fermented to leave a touch of residual sugar and then loaded up with lactose to offer ice-cream like body and the perception of sweetness. Vanilla goes in for the full ice-cream affect, as well as Cypress wood. The wood spirals lend a nice undertone of vanilla wafer that complements the beer, but also gives us complexity and a rounded character that completely balances the beer. All this works with the coffee to create a unique, style-defying drink that we hope will fascinate and delight. Recommended food pairing: Biscotti, of course!